Lukas Cingel scored the biggest goal of the Baie-Comeau Drakkar's season on Friday night. When I’m writing or editing Canadian Hockey League stories I always try to keep in the back of my mind that these players are amateurs. Not just amateurs, but young men (and occasionally women) who are completing high school or starting university soon. More often than not they’re living far away from home, away from their families and friends. Because of that, I try to focus on the positives in a game. For example, I don’t like to mention who took a costly penalty that led to a power-play game-winning goal. It may have been an honest mistake and sometimes penalties are worth taking – like tripping or hooking to stop a breakaway. Also, I try to avoid over-emphasizing that a team lost. I would never write “Bobby Jones made 10 saves in a losing effort.” There’s no need to underscore that a team lost, it’s already apparent in the story’s lede. It might be true, but it’s unnecessary to rub it in poor Bobby Jones’ face. There’s just no need to go out of my way to point out the mistakes of amateur athletes who, in some cases, aren’t even old enough to vote. But I had to break that rule for Friday’s Quebec Major Junior Hockey League round up. The Baie-Comeau Drakkar finally won their second game of the season, bringing an end to a 25-game losing streak, the third longest winless streak in league history. Although most of the article detailed the historic significance of Baie-Comeau’s skid, there was a focus on the fact that they had won, and on the remarkable play of Lukas Cingel. It took months, but the Baie-Comeau Drakkar finally won again. Lukas Cingel scored on the power play with 17 seconds left in the game to lead Baie-Comeau past the Rouyn-Noranda Huskies 4-3 in Quebec Major Junior Hockey League action Friday night. It was just the second win of the season for the Drakkar, snapping a 25-game winless streak. Ryan Ellis was the star of the show without even scoring a goal on Friday night. Zack Kassian scored twice and Ellis had three assists as the Windsor Spitfires defeated the Oshawa Generals 5-2 in Ontario Hockey League play. Ellis, Windsor's team captain and the 2009 first-round draft pick of the Nashville Predators, was honoured in a pre-game ceremony for becoming the all-time leading scorer in Spitfire history. Kevin Sundher had two goals and two assists as the Chilliwack Bruins thrashed the Western Hockey League-leading Portland Winterhawks 7-2 Friday night. Ryan Howse registered a goal and an assist, while the Bruins (12-9-3) scored seven unanswered goals in the second and third periods. David Honzik is starting to find his legs in the Quebec Major Junior Hockey League. Honzik made 27 saves as the Victoriaville Tigres rolled over the P.E.I. Rocket 6-0 on Saturday night. 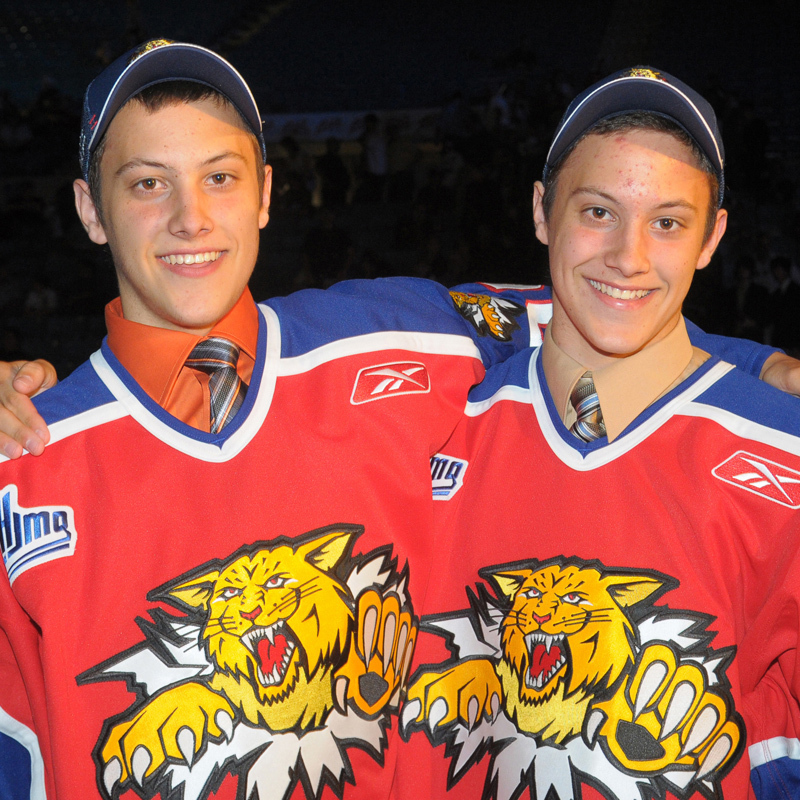 It was the 17-year-old goaltender's first shutout in his rookie season in the QMJHL. Saturday night was a good night for scoring streaks in Barrie. 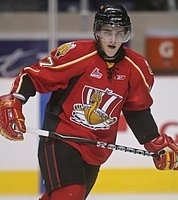 Daniel Catenacci scored a pair of goals to lead the Sault Ste. Marie Greyhounds to a 6-5 victory over the Barrie Colts in Ontario Hockey League action. Catenacci, who extended his current goal streak to six games, has now picked up a point in 19 of his last 20 contests. Once the Kootenay Ice got scoring there was no stopping them Saturday night. Kootenay ended a long scoring drought with three power-play goals in the first period and went on to rout the Seattle Thunderbirds 6-2 in Western Hockey League play on Saturday night. The Saint John Sea Dogs are riding their hot streak to the top of the Quebec Major Junior Hockey League standings. Zack Phillips opened scoring for Saint John with back-to-back goals as the Sea Dogs trounced the Halifax Mooseheads 7-1 on Saturday afternoon. Casey Cizikas, Devante Smith-Pelly and Riley Brace kept their team rolling on Sunday afternoon. The line combined for four goals and seven points in leading the Mississauga St. Michael's Majors to a modern-era franchise record in the Ontario Hockey League with a 6-3 victory over the Owen Sound Attack. Tyler Toffoli of the Ottawa 67's celebrating yet another goal. Unfortunately, my Twitter account has been acting up a little, both online and on my Blackberry. Otherwise, I would have been Tweeting all last week about how excited I was for Sunday’s match between the Ottawa 67’s and Rangers in Kitchener, Ont. Those two clubs have the best offences in the Ontario Hockey League and rank with the Portland Winterhawks, Moncton Wildcats and Lewiston Maineiacss as some of the most potent attacks in junior hockey today. The Rangers have league-leading scorer Jason Akeson as their top forward. Unbelievably, this talented winger has gone undrafted the past two years, and went unsigned after a free agent tryout with the Anaheim Ducks. Akeson’s 12 goals and has set up 34 others so far this season are undoubtedly making general managers across the National Hockey League regret not signing him. Who’s trailing Akeson in the scoring race? Ryan Martindale of, you guessed it, the 67’s. He’s got 17 markers and 23 assists so far this season. Martindale’s linemate Tyler Toffoli is leading the league in goals scored with 22. Kitchener’s Gabriel Landeskog is right behind him with 19. In other words, Sunday’s game promised to have some offensive fireworks. The game definitely did not disappoint, either. Toffoli and Shane Prince ­– fourth in OHL scoring – scored in the shootout as the 67’s edged the Rangers 5-4. Toffoli also scored twice in regulation, Martindale had two assists and Prince had one. Landeskog had a pair of goals and an assist, while Akeson padded his scoring lead with a goal and an assist. Games like that are what make hockey great. The Halifax Mooseheads started one streak and kept another alive Friday night. Konrad Abeltshauser put away the winner 4:09 into the third period as Halifax shaded the Rouyn-Noranda Huskies 3-2 in Quebec Major Junior Hockey League action. Devante Smith-Pelly's second goal of the game midway into the third period lifted the Mississauga St. Michael's Majors to a 2-1 victory over the Niagara IceDogs in the Ontario Hockey League Friday night. The winner came as Smith-Pelly broke in on the right wing, took a pass from centre Casey Cizikas and beat Niagara goaltender Mark Visentin from close range. Greg Lamoureux's goal 1:58 into overtime gave the Vancouver Giants a come-from-behind 5-4 victory over the Regina Pats in Western Hockey League action Friday night. Brendan Gallagher led the Giants (13-8-3) with two goals and an assist and also drew the penalty that set the stage for Lamoureux's winner. Matt MacKay and Nathan Burns also tallied for Vancouver in a wildly entertaining game before a raucous crowd of 11,476 at the Pacific Coliseum. The Lewiston Maineiacs continued to roll through their Quebec Major Junior Hockey League competition Saturday. Olivier Dame-Malka scored in overtime as the Maineiacs edged the Shawinigan Cataractes 2-1 for their 10th straight win. Lewiston sits fourth overall in the QMJHL. Captain Andrew Agozzino led his Niagara IceDogs by example Saturday night. Agozzino scored four times as Niagara dropped the Ottawa 67's 5-3 in Ontario Hockey League action. Nino Niederreiter scored a pair of goals and Taylor Aronson had a goal and two assists to lead the Portland Winterhawks past the Kamloops Blazers 6-4 in Western Hockey League play on Saturday night. The game turned ugly at the end of the second period with three fights breaking out after the horn had sounded. The Quebec Remparts knew they needed to beat the Lewiston Maineiacs to hold on to their lead in the Quebec Major Junior Hockey League's East Division. Martin Lefebvre opened the scoring for Quebec and added two assists as the Remparts got a crucial 4-2 victory against the rival Maineiacs Sunday afternoon. The Ontario Hockey League's most prolific offences were on full display Sunday afternoon. Shane Prince and Tyler Toffoli scored in the shootout to power the Ottawa 67's past the Kitchener Rangers 5-4 in a game that showcased some of the best forwards in the league. The re-emergence of New York Islanders prospect Kirill Kabanov is just one of many storylines developing in the CHL this season. News stories at the start of the Canadian Hockey League season – really, any sport’s year – tends to focus on team events. After all, there are team previews, predictions and personnel moves to write about. On the other hand, there are no individual accomplishments that are worth reporting on. Let’s face facts: the current scoring leader isn’t that impressive when there are a dozen players within two points. This weekend saw many of those individual stories finally begin to develop. Friday night was the beginning of the latest chapter in Kiril Kabanov’s Quebec Major Junior Hockey League career as he debuted with the Lewiston Maineiacs, his third junior club in as many years. On Sunday, Kitchener’s Jason Akeson and Ryan Murphy were put on centre stage as they continued to dominate the Ontario Hockey League’s scoring race, dishing out seven assists between the two of them as their Rangers easily handled the London Knights. I wholly expect that, barring injury, Kabanov, Akeson and Murphy will be players that I write about all season. Sure, there are still some team-oriented stories to write about, like Saturdayès story of the surprising losing skid of the top-ranked Quebec Remparts, but the development of individual storylines will help add a little diversity to my news stories. Give the CHL a few more weeks and we’ll really see some of the individual characters start to shine in the QMJHL, OHL and Western Hockey League. The debut of Kiril Kabanov barely figured into the Lewiston Maineiac's impressive win streak on Friday night. Olivier Dame-Malka scored twice, including the eventual winner, as Lewiston prevailed over the Val-d'Or Foreurs 5-2 in Quebec Major Junior Hockey League action. Ramis Sadikov celebrated in style on Friday night. The Erie Otters' second-year goaltender recorded his first Ontario Hockey League shutout in a 4-0 win against the Midwest Division-leading Owen Sound Attack. Taylor Aronson scored 3:40 into overtime to give the Portland Winterhawks a 4-3 win over the Red Deer Rebels in Western Hockey League play on Friday night. The Winterhawks spent most of the extra period in Red Deer's end of the ice, generating several chances. Suddenly, the Quebec Remparts don't look so hot. Louis Leblanc's power-play goal early in the third period stood as the winner as the Montreal Juniors slipped by the Remparts 3-2 in Quebec Major Junior Hockey League action Saturday night. The Kingston Frontenacs just won't let up on the Belleville Bulls this season. Kingston continued to have the Belleville's number Saturday night, pulling out a 3-2 shootout win in Ontario Hockey League action. Brendan Rowinski scored twice and added an assist for the Moose Jaw Warriors in their 5-3 win over the Regina Pats in Western Hockey League action Saturday night. Moose Jaw scored five unanswered goals to register their fifth-straight win. 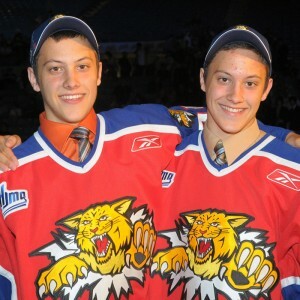 Zach O'Brien and David Gilbert did most of the heavy lifting for the Acadie-Bathurst Titan on Sunday afternoon. O'Brien and Gilbert had shootout markers to lead the Titan past the Chicoutimi Sagueneens 4-3 in Quebec Major Junior Hockey League action. Jason Akeson and Ryan Murphy are getting results through their unselfish play. Akeson had four assists as the Kitchener Rangers had three unanswered goals to race past the London Knights 5-4 in Ontario Hockey League action Sunday afternoon. Although I take a lot of pride in the writing I have to do as a junior hockey editorial assistant, that’s one of the smaller parts of what I do. Most of my weekend is spent editing the work of other writers. The vast majority of game stories published by the Canadian Press have been written by reporters on location called stringers. Our junior hockey stringers send their work in to our office in downtown Toronto. It’s then reviewed, changed (if necessary) and put out on the wire. From start to finish the process should take approximately 5-10 minutes from the final whistle of a game. The better the stringer, the faster the turnaround. So what do I look for in my stringers? Speed – Thanks to the Internet I’ve got a pretty good idea of when the game ended. The longer it takes for a stringer to get the story to me, the more anxious I get. Why? Because if I know the game’s over, so do our readers and clients, and the news business is all about the quick and efficient spreading of information. If we’re not fast, we’re letting our consumer down. Accuracy – Obviously, all that speed is wasted if there’s a mistake in the story. Having the correct score, players, spelling, even the date (yes, people mess up what day of the week it is) is all crucial. More than anything else, accurate copy is what makes a good stringer. If I have to check every stat on the Internet, you're not doing your job. Clarity – My biggest pet peeve is when I can’t make heads or tails of what’s happening in the story. A good stringer will have the final result, every scorer’s name (and how many points they had) and every goaltender’s stats in the first three paragraphs of their story. Basics like the team names, records, the league and the day of the week should be in the first paragraph. Don’t hide the scorers at the bottom of the piece, or scattered throughout. Get down and dirty as quick as possible. Simplicity – Straightforward writing goes hand-in-hand with clear writing. Don’t tell me that someone “tallied” or “netted” or “potted” a goal when you haven’t used “scored” yet. Even “Greg McKegg had two goals” sounds better than “McKegg potted two goals”. A lot of stringers get a case of nerves and over-describe the play. Keeping it simple makes it easier to read and doesn’t clutter the reader’s mind. It also makes it less likely I’ll need to edit your masterpiece. If you’re ever writing a game story just take your time and go with the simplest descriptions. Let your reader’s imagination fill in the blanks. Your personal style will shine through no matter what you do. Fortunately for me, my crew of stringers was on fire this weekend and provided me with lots of great, easy to read copy. All of them met those four expectations, and it made my life much easier. On to the round ups! It turns out that Evan Mosher is something of a late bloomer. The 20-year-old goaltender made 28 saves as the P.E.I. Rocket blanked the Halifax Mooseheads 3-0 in Quebec Major Junior Hockey League action Friday night. Casey Cizikas had a goal and set up two others Friday to power the Mississauga St. Michael's Majors to a 5-1 victory over the Kingston Frontenacs in Ontario Hockey League play. Three minutes after setting Devante Smith-Pelly's opener, the 19-year-old Cizikas scored a short-handed goal to put the Majors up 2-0 with six minutes left in the first. It was a rough homecoming for Nino Niederreiter on Friday night. Brad Ross had the eventual winner as the Portland Winterhawks flew past the Kelowna Rockets 4-2 in a very physical Western Hockey League game. Charles Bety and the Halifax Mooseheads are making the Quebec Major Junior Hockey League a little more competitive. Bety had back-to-back goals as the Mooseheads upset the Moncton Wildcats 5-2 on Saturday night. 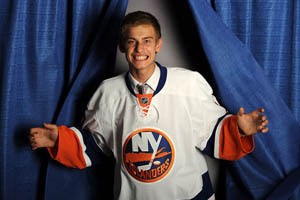 Kale Kerbashian saw his teammates reel off three-straight goals and figured he should join in on the fun. Kerbashian had a hat trick to help the Sarnia Sting beat the visiting Brampton Battalion 6-3 in Ontario Hockey League action Saturday night. The Spokane Chiefs just kept coming on Saturday night. Levko Koper had two goals and four assists to help Spokane light up the Regina Pats 11-1 in Western Hockey League play. The Baie-Comeau Drakkar were close to a major upset Sunday afternoon, but not close enough. Joel Champagne scored in overtime as the Quebec Remparts narrowly escaped defeat against Baie-Comeau to pull out the 3-2 win in Quebec Major Junior Hockey League action. Justin Shugg scored three times and added an assist to guide the Mississauga St. Michael's Majors to a come-from-behind 7-5 victory over the Sudbury Wolves in the Ontario Hockey League on Sunday afternoon. Chris Doyle had the eventual winner for the Majors (11-2-0), while Casey Cizikas, Jordan Mayer and Gregg Sutch also tallied. Stefan Elliott scored the game-winning goal with 59.1 seconds left in regulation to lead the Saskatoon Blades to a 5-3 win over the Calgary Hitmen in the only Western Hockey League game Sunday afternoon. Curtis Hamilton added a empty netter for his second goal of the contest for the Blades (11-4-0), while Darian Dziurzynski and Braeden Johnson also scored. This probably goes without saying, but, one of the crucial aspects of journalism is timing. People want their news to be delivered as quickly as possible. Sports reporters are fortunate because they can guess – usually with some accuracy – when a game is going to end. A baseball game is usually three hours long, hockey two and a half hours, etc. This is particularly important when covering three leagues across the world’s second largest country, as I do. See, my junior hockey games end in waves. Thanks to six teams being in the Atlantic time zone, the Quebec Major Junior Hockey League starts to wrap up between 8:30 and 9 most nights. The rest of the Q and the entire Ontario Hockey League follow suit between 9:30 and 10. Out west is a little more complicated as the Western Hockey League stretches across three time zones. Games in Manitoba and Saskatchewan (and often Edmonton) usually finish between 11 and 11:30. British Columbia, Washington and Oregon check in between 12:30 and 1 in the morning. Obviously, if one of these waves is delayed, they start to crash into each other. If writing the QMJHL round-up takes me past 11 at night, the OHL stories will be late, and so on. Even the WHL can run into another deadline: my ability to stay conscious. More often than not, the cause of a delay is a slow game. And what is the cause of a lethargic game? More often than not, it’s because of fights. Think about it: Each fight eats up about two minutes of play time. Between the scrapping itself, picking up all the loose equipment and sorting out penalties, it adds up to about 120 lost seconds that don’t count toward the game’s run time. Not bad in isolated instances, but if there’s a handful of fights during a game, it can mean tacking on an entire period’s worth of time. Further, fights often mean more work. I need to investigate if anyone was injured, what the cause was, and if it’s a particularly rough game I have to find a way to describe the melee. A perfect example of a game that caused massive back up in my shift was Friday night when the Cape Breton Screaming Eagles and Halifax Mooseheads mixed it up in a fight-filled match. Fortunately for me, the Halifax Chronicle-Herald’s Willy Palov was in attendance and he forwarded me his game story for inclusion in the nightly QMJHL round up. He saved me a lot of time and added a lot of detail to my story, but even then, some time was eaten up getting in touch with him and then editing his story to suit my needs. I don’t mean for this to be a commentary on the role of fighting in hockey, I just wanted to share the practical ramifications of when your two favourite hockey teams start throwing down. BONUS: Here’s a link to Mr. Palov’s original story on the Screaming Eagles 7-2 win over the Mooseheads. You’ll be able to see the different angles we took on the game (his local, mine broader) and also what parts were thanks to his hard work. Also, big ups to CP Sports editor Josh Clipperton who, like all my editors, made my copy much sharper. The Nova Scotia rivalry in the Quebec Major Junior Hockey League erupted in spectacular fashion Friday. 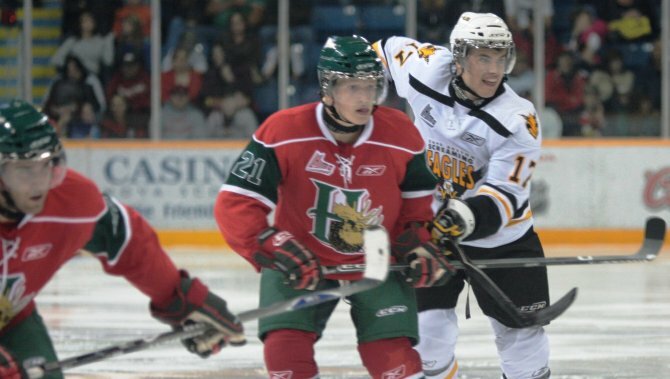 Taylor MacDougall had a hat trick for Cape Breton as the Screaming Eagles cruised to a physical 7-2 win over the Halifax Mooseheads. The Brampton Battalion went to Ottawa with revenge on their minds Friday night. Ian Watters had a goal and an assist as the Battalion avenged themselves with a 3-1 win over the 67's in Ontario Hockey League play. Damien Ketlo recorded his first win of the season with a shutout as the Regina Pats blanked the Swift Current Broncos 2-0 in Western Hockey League action Friday night. Mark Schneider scored the only goal the Pats would need just 54 seconds into the game. It was the defenceman's first of the year with a slap shot from the point. It was supposed to be a night of celebration in Rouyn-Noranda, but the Val-d'Or Foreurs had other ideas. Jonathan Hazen had a hat trick as the Foreurs crushed the Huskies 9-4 in Quebec Major Junior Hockey League action Saturday. Home ice advantage finally meant something for the Barrie Colts on Saturday night. Taylor Carnevale scored twice as the Colts knocked off the Niagara IceDogs 5-2 in Ontario Hockey League action. Mark Friesen posted his eighth win of the season to backstop the Swift Current Broncos to a 3-2 win over the visiting Moose Jaw Warriors in Western Hockey League action Saturday night. Friesen turned aside 33 shots to post the win, and he was beaten for only a single goal in a third period where Moose Jaw held an 11-0 edge in shots. Goaltender Olivier Roy joined an exclusive club Sunday afternoon. Roy made 23 saves to lead the Acadie-Bathurst Titan to a 3-2 win against the Cape Breton Screaming Eagles in Quebec Major Junior Hockey League action. Captain Thomas Nesbitt led his Ottawa 67's by example Sunday afternoon. Nesbitt was the only scorer in the shootout as the 67's were 4-3 winners over the Oshawa Generals in Ontario Hockey League action. There’s a lot to love about hockey, but I think all fans can agree is the unpredicatability of the game. Hockey, and its befooted cousin lacrosse, is made up of a series of broken plays. Yes, there are tactics and strategies that teams employ, but every minute of every game is completely different then the last. No lead is safe, and often the game is decided in the span of a few minutes of play. The video above is a classic – if extreme – example of that unpredictability. What other sport offers a seemingly surefire score, then and incredible last-second tally in the span of 30 seconds? Only hockey. Junior hockey was all about that kind of crazy drama this weekend, with several big games being decided in a quick burst. Friday night started with a bang as the Quebec Remparts, the best team in the Canadian Hockey League, won their 10th game of the season with less than 20 seconds on the clock. The Mississauga St. Michael’s Majors, the second-best team in the CHL, also had some last second heroics on Friday as Jordan Mayer scored in the last minute of overtime. Fans of the Calgary Hitmen were treated to the same kind of action on Saturday night when Jaynen Rissling jumped out of the penalty box to corral an outlet pass and put away the winner in overtime. Finally, back in the QMJHL the Val-d’Or Foreurs reeled off three goals in quick succession to top the Montreal Junior 4-2 on Sunday afternoon. It’s just another reason to love hockey. The Quebec Remparts are still the hottest team in Canadian junior hockey. 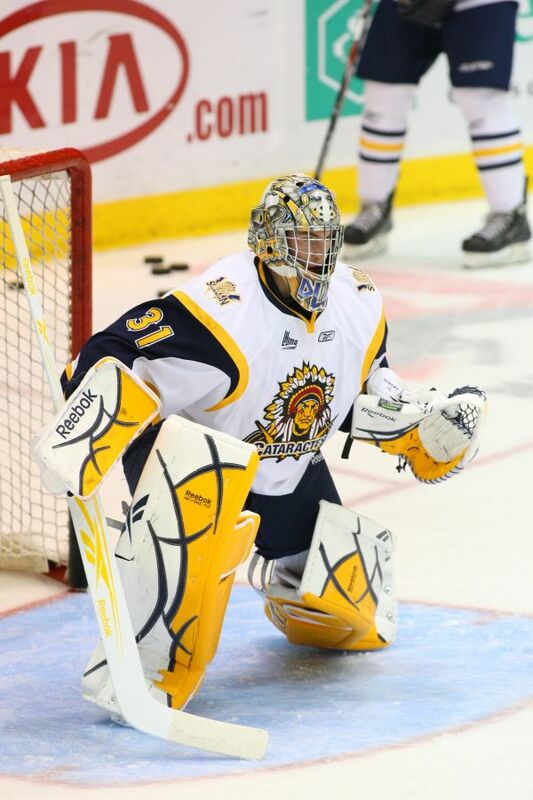 Alex Wall scored the winner with seconds to spare as Quebec edged the Shawinigan Cataractes 3-2 in Quebec Major Junior Hockey League action Friday night. A timely power play made all the difference for the Mississauga St. Michael's Majors on Friday night. Veteran centre Jordan Mayer scored with the man advantage in the dying seconds of overtime as Mississauga rallied to a 4-3 victory over the Sault St. Marie Greyhounds in Ontario Hockey League action. The Kelowna Rockets success overshadowed a landmark for Ryan Howse of the Chilliwack Bruins Friday night. Colton Sissons' goal with 30 seconds left in the second period was the difference maker as the Rockets toppled the Bruins 4-3 in Western Hockey League action. Some personnel changes weren't enough to right the Baie-Comeau Drakkar's ship. Jess Tanguy had back-to-back goals, including the eventual winner Saturday, as the Lewiston Maineiacs sank the Drakkar 4-1 in Quebec Major Junior Hockey League play. Robbie Czarnik had a goal and an assist to lead the Plymouth Whalers past the Windsor Spitfires 4-1 in Ontario Hockey League action Saturday night. "(Rickard) Rakell got in hard on the forecheck," Czarnik said about his goal. "He got to the puck before everybody else and got it to me and I snuck it by (Jack) Campbell." Jaynen Rissling went from goat to great in a two-minute span Saturday night. Rissling was the overtime hero by scoring an unassisted power-play goal to lift the Calgary Hitmen to a 3-2 win over the Seattle Thunderbirds in Western Hockey League action. It took less than two minutes for the Val-d'Or Foreurs to drop their division rivals Sunday afternoon. Guillaume Naud had back-to-back markers, including the winner, as the Foreurs scored three quick goals in a 4-2 win over the Montreal Junior in Quebec Major Junior Hockey League action. Thomas Nesbitt scored twice and added an assist and Petr Mrazek made 41 saves as the Ottawa 67's defeated the Brampton Battalion 5-1 in Ontario Hockey League play Sunday afternoon. Nesbitt was very effective on special teams, scoring on the power play and short-handed. Saturday's victory might be one of the few times I'll have a reason to mention the Kelowna Rockets this season. One of the hardest things about writing junior hockey copy night after night is choosing what story should be at the top of the league round up. What merits consideration? If I based it solely on the performance of a team people would get sick of hearing about the top 10 clubs all the time. What about if I wrote based off of population size or team popularity? Then the Halifax Mooseheads, Montreal Junior, Mississauga St. Michael’s Majors, Ottawa 67’s, Edmonton Oil Kings, Calgary Hitmen and Vancouver Giants would dominate the stories. Instead, I try to pick the game situations that are the most unique. That’s why Nicolas Chouinard’s five-goal night led the Quebec Major Junior Hockey League round up on Friday night. The sock trick (as it’s called in lacrosse circles) is a rare occurrence at all levels of hockey. The dominant play of Vancouver’s special teams also caught my eye on Friday. It’s not often tthat a team can kill nine penalties while going 50-50 on the power play. It just had to be given top billing. Saturday night had three different unique or special games, one in each league. In the QMJHL, goaltender Olivier Roy was given a shutout by official scorers, despite the fact that he let a goal in during the shootout. In the Ontario Hockey League, the once-dominant Barrie Colts continued to struggle, particularly at home. Worse yet, it was on the same night that they raised last year’s Eastern Conference championship banner to the rafters. Out west, the Kelowna Rockets finally won a game, the last Canadian Hockey League team to accomplish this rather basic feat this season. I’m sure that these stories aren’t the most significant in terms of the final standings, and they’re certainly not a showcase for prospective National Hockey League draftees. But they are interesting or quirky stories, and I think that that is what draws the most people in, week after week. Captain Nicolas Chouinard decided to lead by example on Friday night. Chouinard scored five times as the Montreal Junior downed the Halifax Mooseheads 6-3 in Quebec Major Junior Hockey League action. The Mississauga St. Michael's Majors got down to business in the third period Friday night. Casey Cizikas and Joe Cramarossa scored 32 seconds apart early in the final period and goaltender JP Anderson had his first shutout of the season as the Majors blanked the struggling Peterborough Petes 3-0 in the Ontario Hockey League play. The Vancouver Giants are relying on their special teams to get wins this season. Vancouver reeled off three unanswered power-play goals to snuff the Kelowna Rockets 4-1 in Western Hockey League play Friday night. Even though he let the puck into the net on Saturday night, goaltender Olivier Roy earned a shutout. Roy made 32 saves as the Acadie-Bathurst Titan downed the Drummondville Voltigeurs 1-0 in a shootout in Quebec Major Junior Hockey League play. Last season playing against the Colts in Barrie was one of the toughest draws in the Ontario Hockey League, but no longer. Andrew Agozzino scored the game-winning goal 6:10 into the third period as the Niagara IceDogs defeated Barrie 4-1 in OHL action Saturday night. It took an extra period but the Kelowna Rockets finally won a game. Brett Bulmer scored the overtime winner for Kelowna, as the Rockets beat the Prince Albert Raiders 3-2 in Western Hockey League action Saturday night. Philip-Michael Devos' small output was just enough to make him the Quebec Major Junior Hockey League's top scorer. 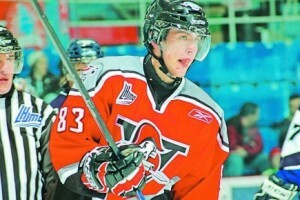 Devos had two assists as the Victoriaville Tigres beat the Lewiston Maineiacs 4-2 in QMJHL play Sunday afternoon. Robbie Czarnik scored twice, including the overtime winner, as the Plymouth Whalers toppled the Kingston Frontenacs 6-5 in Ontario Hockey League action Sunday afternoon. Stefan Noesen had two goals and one assist for Plymouth (3-4-1), while Scott Wedgewood made 32 saves. Tyler Brown and Austin Levi added singles for the Whalers. Czarnik also had two assists.